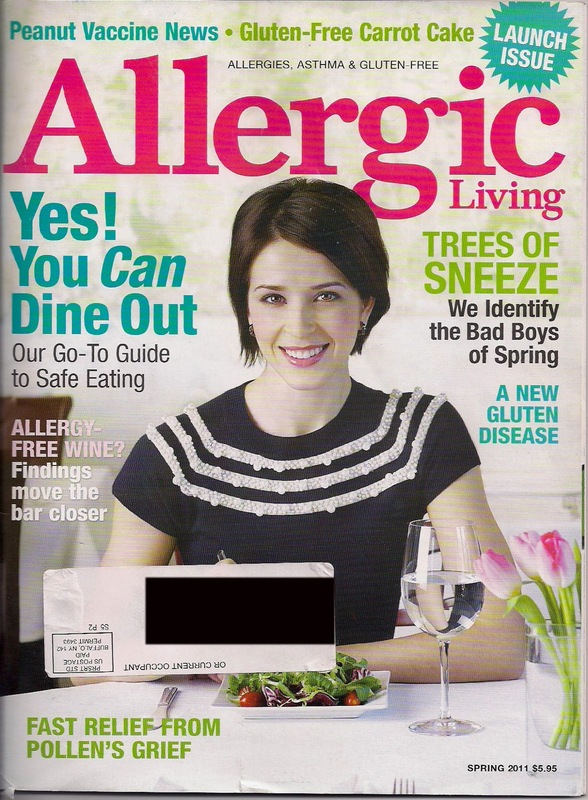 The Food Allergy Queen: The FAQ interview in Allergic Living Magazine! 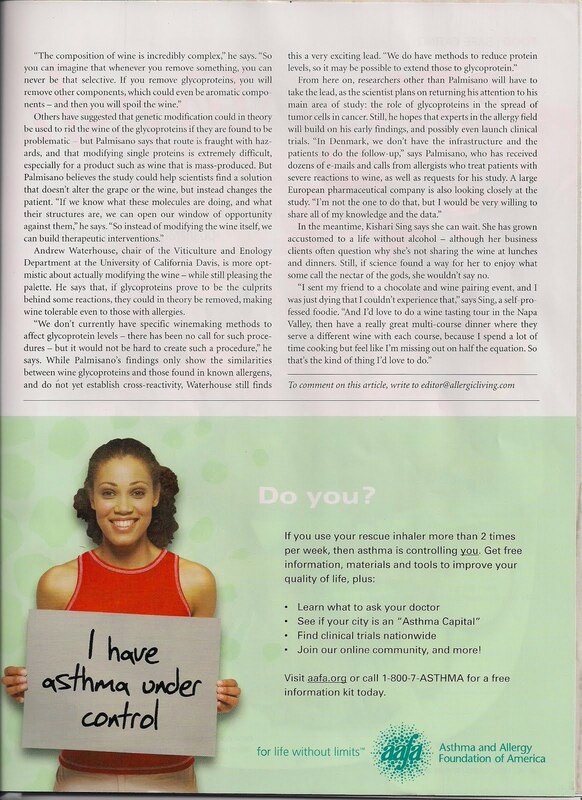 The FAQ interview in Allergic Living Magazine! Hey, guess what? ("What?") I had almost forgotten that I did an interview with Allergic Living magazine a few months ago, then once the magazine actually arrived I forgot to post about it. Silly rabbit. FYI, Allergic Living is based out of Canada, this Spring issue is their first US version so us Americanos may be unfamiliar with it! They wanted to ask me about -- wine allergy of all things (thanks to Allergic Girl for helping them find me!). Of course I have an allergy to wine, I'm the Queen! :) I go beyond the "Asian Flush" (many Asians turn red because we do not process alcohol well, similar to American Indians). Actually, alcohol is the item on my list that is the most dangerous for me as it sends me straight into anaphylactic shock. 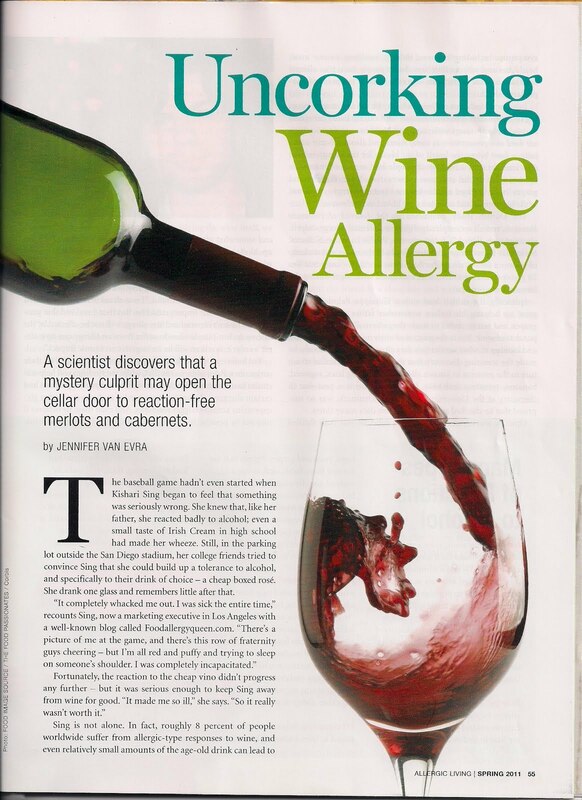 This interview about because there is a brand-spanking-new study out that suggests that there could be a protein specific to wine contributing to wine allergy, and they wanted to talk to someone who had wine allergy. 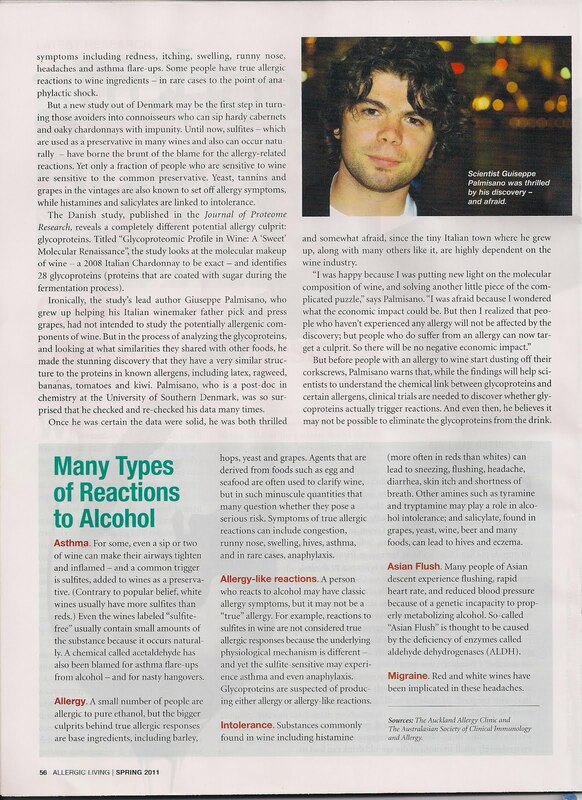 So I chatted with Jennifer the writer about my allergy to alcohol in general, and wine especially. I had always attributed the additional yuckiness to the sulfites (allergic to those too, yup), but now know it could be more than that. They didn't post the entire story online, so I'll upload scans of the pages here. Click on these to enlarge the page and be able to read the article in its entirety. Salut!